When Is A Pier Not A Pier? A Pier /pɪə/ noun A platform on pillars projecting from the shore into the sea, typically incorporating entertainment arcades and places to eat. A Railway Pier Sometimes called pier tramways – a railway pier provides transport via railway lines along the length of a pier. 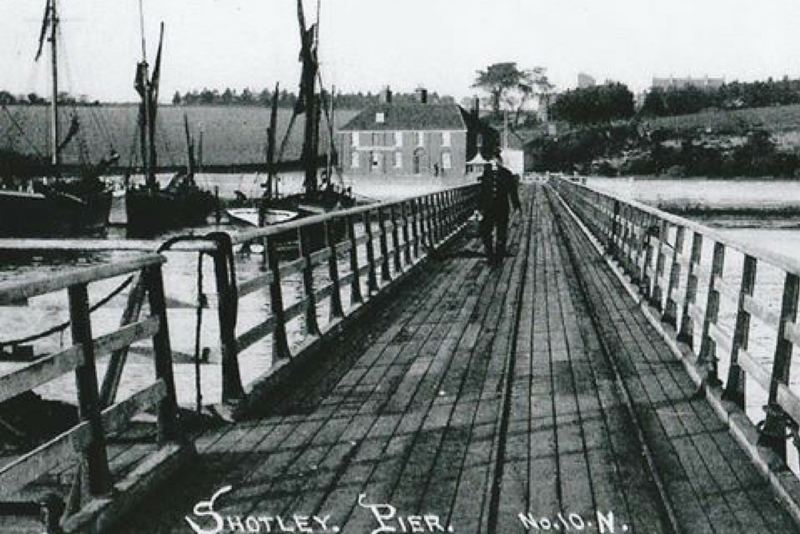 Contrary to the name, Shotley Railway Pier has never seen any trains. Its name comes from the railway lines along the length of the pier on which railway trucks, aka dollies, were used on the rails to transport Royal Mail from Harwich to Shotley. The mail was delivered at the pier and transported up the hill, to be sorted at the Shotley Gate Post Office before making its way into Ipswich. It was a working pier, used by fishermen and ferrymen. It is sturdy and strong, built to withstand the ravages of sea and weather, time and tides.